I first rode a Dan Mayer saddle about 13 years ago . I was living in New Mexico and branding calves in southern Colorado. 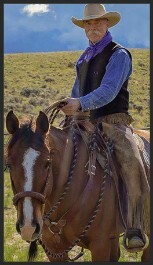 The ranch hand where we were branding and I traded mounts for an experiment and I liked his saddle a lot. 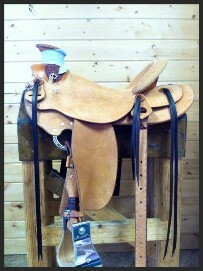 The saddle was made by Dan Mayer. Soon after that I moved back home to Montana. The first place I stopped was at Dan Mayer's saddle shop in Lima. Dan and I really hit it off and I left his shop with a daisy stamped Wade on order and a reata to build as a down payment! Since that first visit , Dan and I have spent a lot of time discussing form, fit and function, what tree fits what type of horse etc...etc.... I ride a large variety of horses with different shaped backs, and Dan and I have put our theories of fit and function to the test in the real world . The results have been most satisfying. . I own two Dan Mayer Wade saddles, one has a 4" gullet with a 90 degree bar spread, the other a 4" gullet with 93 degree bars. Between the two, and with proper padding, there isn't much I can't fit well . There are a number of really good saddle makers to choose from today. There are also a few master craftsmen who form the top tier of current makers . In my opinion, Dan is among those master craftsmen who's work sets the standard for excellence. Dan’s saddles are super clean, with pleasing lines. The mechanics are second to none, the fit, form and function are as good as you will find anywhere. The artistic embellishment is tastefully and expertly executed. Not only is Dan a great saddle maker, he is a great guy . He's about as steady, honest, and likable as anyone I know. I meet many people in my horsemanship program who ask about saddles . I tell them without reservation that Dan Mayer is a master saddle maker YOU can trust to do HIS best work on YOUR saddle order. I wanted to take the time to truly express my deepest gratitude for your having created an incredible custom saddle for me. I also wanted to write this in hopes that I can provide any future customers with an opportunity to read about my experience. I am absolutely certain that purchasing my custom saddle from Mayer Saddlery was the best decision I could have made to support my horsemanship. Prior to working with Dan and Jeff my history with saddles had been a tumultuous one. The various saddles I purchased never met all of my and my horses’ needs. No matter what saddle I tried, and there were many, I never found one that fit me, and my horses. My saddle fitting experiences were disappointing, tedious, and just darn expensive. I was lucky enough to be referred to Dan by my friend Paul Dietz. I rode in one of Dan’s saddles and knew immediately that it had the exact feel that I needed. Upon having extensive discussions and reviews of my horses’ measurements and needs, I was confident that I had found the right saddle maker. The caveat is that I had also envisioned a saddle that would artistically represent and symbolize my horsemanship journey, as well as my having been born and raised in Wales. With this in mind, I had unearthed multiple Celtic symbols and images of the Welsh dragon that really spoke to me. Celtic knot work and imagery has such a challenging symmetry and balance in its patterns, especially when done free hand. I truly knew that what I was asking of Dan and Jeff to construct was quite complex. The saddle has unrivaled quality, feel, and craftsmanship. I have finally experienced what it is like to have one that puts me in the right position, while also fully enabling my horses to move out without restriction. To ride in it is a dream. 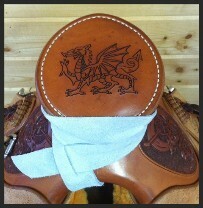 Dan and Jeff, thank you again for creating the saddle that I envisioned. You are true craftsman, and a pleasure to have worked with. I know that anyone who purchases a custom saddle from you will be equally as delighted with the decision, and for many years to come.